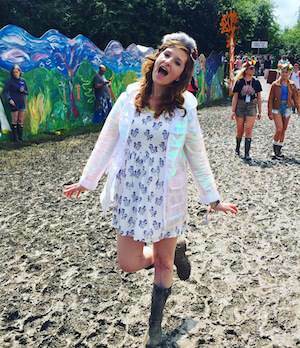 What better time to get feathers in your hair than when you're working festival season?! I've seen a couple of these hair feather stands around the festivals this year and decided to get some put in at NASS a few weeks ago. They were done by Feather Tree and so easy to install, it took seconds! Please excuse the frizz in the photos, it's the humidity ;). They take a tiny piece of hair and thread it [plus the feathers] through a small metal clamp. They then squeeze the clamp and secure the feathers to the hair. To remove, all you have to do is take normal household pliers and squeeze the clamp the opposite way to release. The feathers can be washed and styled the same as your normal hair, apparently if looked after well they can last up to six months! Mine have been in for about 3 weeks now and they're still the same as when they were put in, apart from a tiny kink has appeared in the photo above, probably created by my frizzy bedhead hair. I think the feathers look really great in your hair and you're right it's perfect for festival season! I love feather hair extensions!! Oh I love these! They look like a great more unusual alternative to the flower crown which is EVERYWHERE this year! what a fun post! you rock the feathers!